In formulating our plans, we have consulted with businesses in all four corners of West Cheshire & North Wales and with other organisations campaigning on the issues we raise. The variety of perspectives and expert opinions we received in our consultations have been built into this document, such that the West Cheshire & North Wales Chamber of Commerce can state with absolute certainty that our campaign truly and accurately represents the needs and wishes of our region’s business community. Ensuring we are the Authentic Voice of business that can deliver locally. Creating enhanced Infrastructure & Connectivity for our region. Bridging the Skills gap across West Cheshire & North Wales. Promoting International Trade and stimulating regional Business Ambition. One of the core missions for the West Cheshire & North Wales Chamber of Commerce is to provide a voice for the local business community. It is our goal to ensure that the voice of businesses – whatever the size – is heard when decisions are made in local, regional and national government. Our vision aims to develop a transport network that supports the needs of businesses. It also aims to provide businesses with access to cutting-edge communication technologies and the knowledge to use them effectively. Our vision aims to develop a skilled and able workforce across all sectors, allowing our businesses, and in turn the economy of West Cheshire and North Wales, to grow and thrive. The most important foundation for any economy is the skills and talents of its people. Our businesses can only perform as well as the people that start, run and work in them. Our vision aims to open up the world to West Cheshire and North Wales businesses, providing them with the support needed to access more customers in different markets. Focussing West Cheshire and North Wales’ economy on more sustainable sources of growth is essential for our long-term growth. 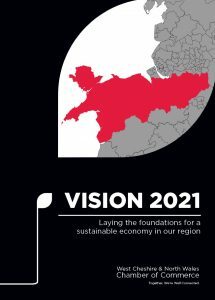 The full Vision 2021 document can be viewed here.